From middle-of-the-night wakeups to constantly (no, constantly) finding food on the floor, let’s be honest here: Kids are crazy. That’s why there’s Twitter. Reading about other moms’ and dads’ trials and tribulations with their children can make our lives seem a teeny bit less nuts. And of course, it’ll make us laugh along the way. Here are this week’s most hilarious tweets from parents. 5yo drawn a picture for his friend. Would be quite sweet were it not titled Devil vs Dog Poo! And I wonder why he doesn't get invited over? Taught my 5 year old how to read a clock & now she's updating me on the time every single minute. This may be the longest day of my life. I'm pretty sure psychedelic music was invented by parents who heard a kid's toy losing battery life and thinking it sounded cool. Me: How will I know when it's time for him to start wearing deodorant? One sign that you’re a parent, is not finding out about a new movie till it's shown in the electronics section at Costco. 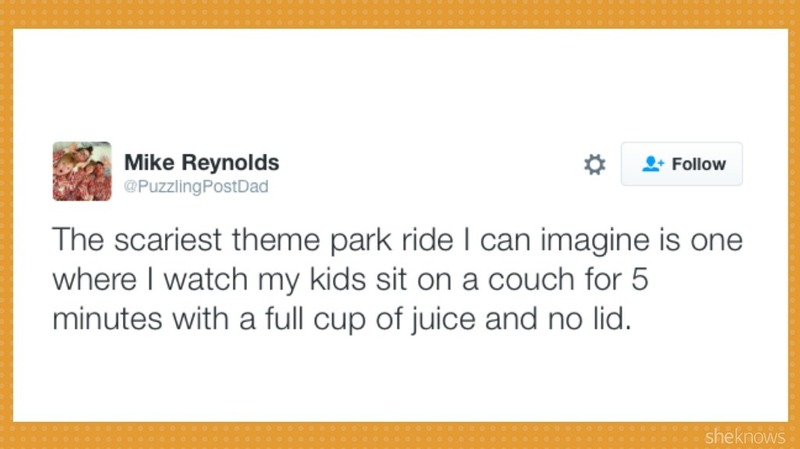 The scariest theme park ride I can imagine is one where I watch my kids sit on a couch for 5 minutes with a full cup of juice and no lid. Googled "Paw Patrol cast" because I couldn't think of Ryder's name. Because how would I get through the day without that vital information. Your first kid is like the first pancake. You're going to pay a lot of attention to it and you're still going to screw it up. Me: Ugh how can people live like this?! Him: This is our house. Me: What the Hell happened?